The Maine Marine Patrol and the Maine Warden Service are well-equipped for rescue operations on inland and coastal waters with a Hovertechnics hovercraft that will be shared by the two agencies. The both cover similar areas - ice-bound waterways and harbors, flooding rivers, coastal flats and areas difficult to reach with any vehicle other than a hovercraft. And they often work together in search & rescue operations. Sergeant Ron Dunham of the Maine Warden Service says, "The hovercraft is like no snowmobile, ATV or watercraft." The hovercraft was purchased through grants from the Outdoor Heritage Fund and Maine Emergency Management Agency. Marine Patrol Pilot Steven Ingram says, "It's important to have this type of technology. If this hovercraft saves one life, it has paid for itself for the rest of its existence." The Maine Marine Patrol / Maine Warden Service Hovertechnics hovercraft glides easily over thin, broken ice. 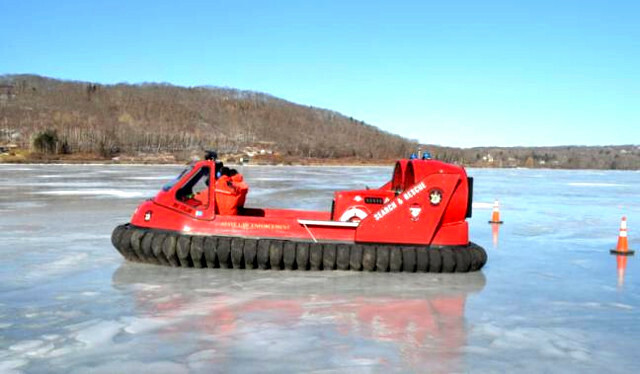 THIN ICE: Hovercraft can skim over thin ice and pull a drowning victim into the craft and return to safety in a few minutes. FLOODING: Hovercraft are critical when when residential areas are flooded and it is almost impossible to use boats to travel down flooded streets because underwater obstacles like fences, fallen trees, submerged walls and vehicles damage boat propellers and put them out of action. 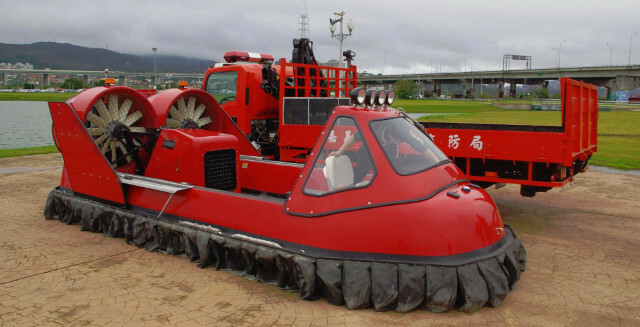 A hovercraft is completely unaffected by underwater obstacles and is able to go over any water depth. SHALLOW WATER: Hovercraft can be used all year round along coastlines where large boats cannot operate due to shallow water conditions. A hovercraft can navigate easily from water to land, over mudflats, marshes, beach areas and along muddy or sandy shorelines.